Check out Fiona's fabulous books on amazon.com! I'm an avid quilter with a great sense of humour and have written three books. 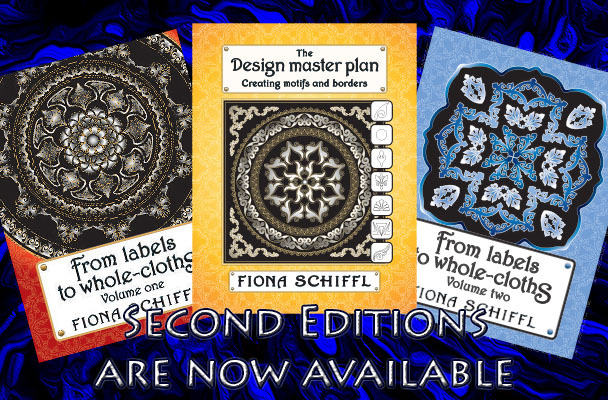 If I can make dozens of quilting designs from one idea, you can too! All images and text are copyright of Fiona Schiffl. You are welcome to put a link back to my blog on your blog. You may also pin images to Pinterest. Please contact me for permission to use the images or designs that I post for your business or in your artwork or quilts. Many of the designs posted are available for use with the purchase of my books. Purchasing the books means that I receive royalties that go into a fund to build a proper sewing studio onto our house. Thank you for your support!